Is it honor or honour? No clearly established Canadian standard according to one Canadian government source. ". . . he’s here (at Western) to consider new ideas and points of view. He might learn something in the process." Arzie Chant took a solid, unassailable position in a letter to the editor of the Gazette, Western University's student newspaper. Perhaps Chant should re-read what he wrote. 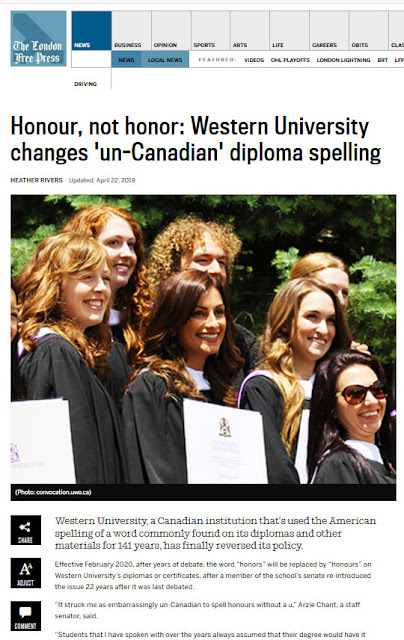 Recently Chant, a member of the school's senate, questioned the use of the word honors rather than honours, with a 'u', on diplomas and certificates awarded by the university. The staff senator told the local paper: "It struck me as embarrassingly un-Canadian to spell honours without a 'u'." This isn't the first time someone has raised this issue. The last time it was debated was 22 years ago. At that time, the university made it clear that it had been consistent in its use of the spelling "honor" rather than "honour" on diploma parchments since its founding in 1878. If you are surprised, don't be. My grandparents, born in the 1870s, were taught from Canadian textbooks that used both spelling, sometime in the same book. Honor was not un-Canadian at that time. Then, around 1890, all began to change. No less a source than the Government of Canada itself states Canadians have Sir John A. Macdonald, born in Glasgow, Scotland, to thank for the confusion. Our first prime minister felt strongly that all parts of the British Empire should hold to the system used in England. And he ordered that “the English practice be uniformly followed” in all government documents. Thus, British spelling was upheld as the standard in Canada. Ideology proved a poor motivator and although governments in Canada fell into step, a lot of folk didn't. 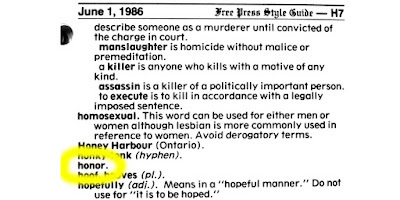 It took Canadian newspapers about a full century before the papers embraced the claimed Canadian spelling. 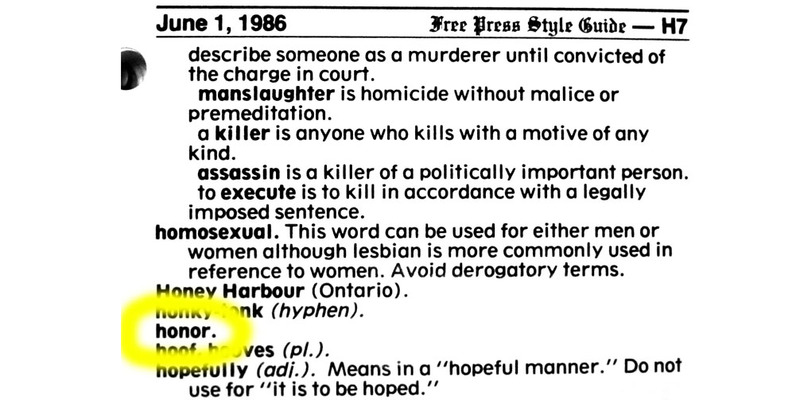 In June, 1986, The London Free Press style guide still accepted only one spelling, honor, no 'u', as correct. And color was the same. the LFP is not un-Canadian. As the university senate pointed out 22 years ago, Brits prefer honour, Yanks write honor and Canadians, for the most part, are free to use whichever spelling they prefer. But soon, not at Western. Arzie Chant claimed it was the "somewhat paternalistic approach of senior administrations" that allowed the continued use of honor without the 'u'. Really? When it comes to paternalistic, Arzie Chant appears to be the culprit and not the university. If he is not careful, his un-Canadian charge may stick to him as well. To see what Western's former position was on this matter, please read the info posted below. It was taken from a university web page that may soon be taken down. After posting this blog, I got a response from one reader questioning the statement: ". . . actual usage in Canada varies." They went on to say, " I disagree. I've never seen the 'or' version used in Canada, unless by mistake. I wonder where that author got that strange idea." I know the answer: Fowler. But, I know another source as well: the Canadian government. I found this days after my original post on a page, dedicated to The Canadian Style. It claims: " . 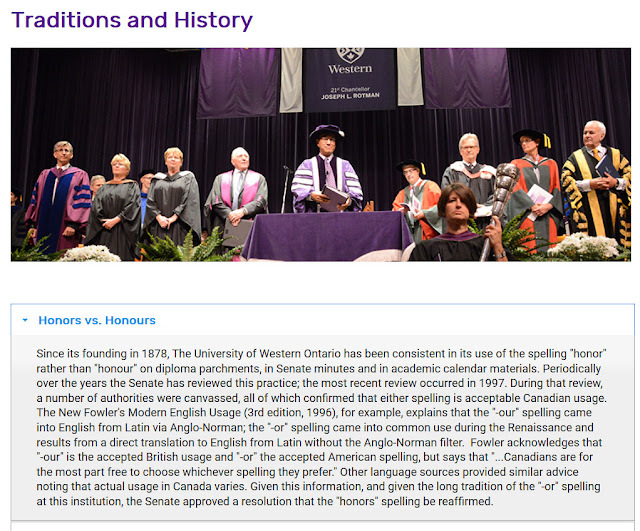 . . as a result of our historical links with Britain and our proximity to the United States, Canadian spelling has tended to waver between the forms used in these two countries, so that, to this day, there is no clearly established Canadian standard." If you feel like reading anymore on this topic, here is suggestion: Testing Canada's 'honour'. I have a friend who likes to promote dairy products, red meats and eggs. This friend has no fear of cholesterol nor saturated fat. It's not my approach and it's not the one promoted by my heart doctors. 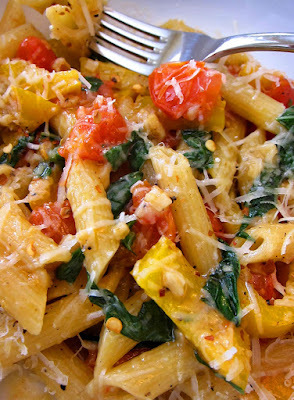 Common sources of saturated fat include red meat, whole milk and other whole-milk dairy foods, cheese, coconut oil, and many commercially prepared baked goods and other foods. When working to reduce the amount of saturated fat in one's diet, one must not replace the lost calories with increased consumption of refined carbohydrates: for instance, white sugar. Instead, keep two alternative fats in mind: mono-saturated and poly-saturated. For mono-saturated fats, look to: olive oil, peanut oil, canola oil, avocados, and most nuts, as well as high-oleic safflower and sunflower oils. For poly-saturated, think: fatty fish such as salmon, mackerel, and sardines, flaxseeds, walnuts, canola oil, and unhydrogenated soybean oil. Note the word unhydrogenated. Hydrogenation creates trans-fats and these are the worst offenders. One must take every measure to get trans-fats out of one's diet. 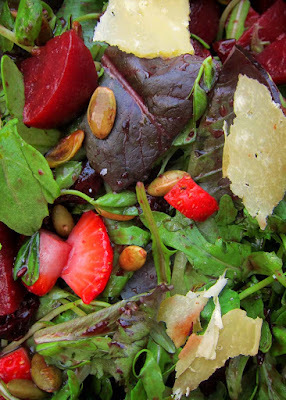 If you read this post, you are clearly seeking information on diet. Keep googling, keep an open mind but be wary of any diet that makes extreme claims or promotes the consumption of saturated fats. (Note: both photos show actual dinners I have served recently. Before dining, I take a moment to grab a photo illuminated by the large window beside our dinner table. 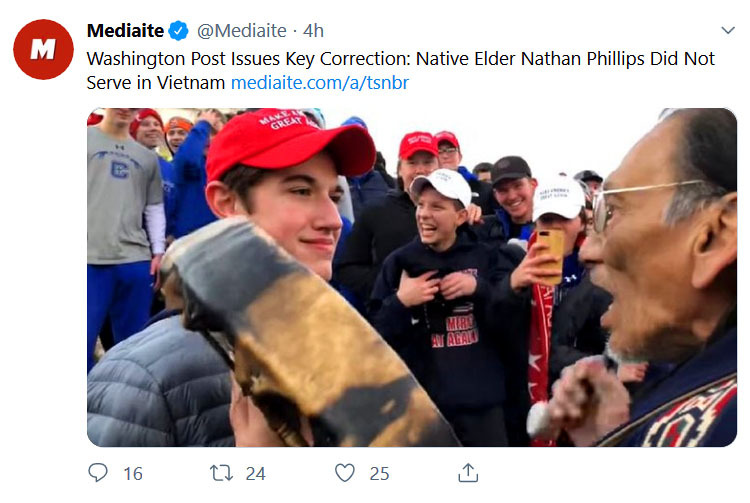 The video of the teen wearing the red Make America Great Again (MAGA) hat in a face to face confrontation with a drum-pounding Native American went viral on social media. 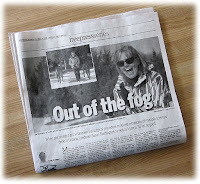 Having spent more than four decade in the media, I am not surprised that newspaper journalists and television news reporters quickly cobbled together a narrative for publication and for broadcast. Sadly, but not expectedly, the story as first reported may have been wrong. One reason for the errors may be found in the way journalist complete for stories and for attention. For years I have contended that journalists should cooperate rather than compete. To a certain extent this position has been validated by the recent ICIJ stories, the International Consortium of Investigative Journalists. If the hundreds of journalists working on this story had worked together, a far more accurate story could have been written and quickly as well. For instance: it would have been clear that the Native American gentleman approached the teens and not the other way around as originally reported by many media outlets. Also, someone would have done the simple math and questioned the claim that the drummer was a Vietnam vet. It took days before this fact made it into the Washington Post. I've also believed that stories should not be rushed into print. Stories should be done with accuracy in mind, not speed. All too often journalists make assumptions. Assumptions are quick. But, assumptions are also often wrong. A quivering BS detector can become a stand-in for facts. Personally, I think there is a good story here. But, sorting it out will take a bit of time. In my humble opinion, journalists must not add to the confusion. I want to look to journalists for truth and not for conjecture. The chap featured below, was the inspiration for this post. I do hope everyone understands I am treating him as the voice of journalism. After all, he was the chair of one of the most respected journalism departments in the province. His position, his actions, are the one's often followed by the industry today. Journalists can rely too heavily on their BS detectors. The other day I saw the above tweet in my Twitter feed. It was posted by Paul Knox, a retired journalism professor from Ryerson in Toronto. 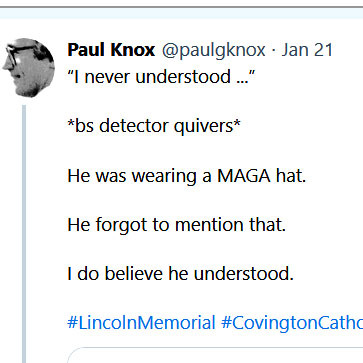 Knox had tweeted that his BS detector was left quivering by the response of the teenage boy featured in the viral video of a standoff between the boy and a Native American gentleman. I tweeted a reply. I didn't mean to upset Knox. I simply wanted to tell him that, after looking at the time stamp on his post, I was surprised a journalism professor was still pumping out the all-too-quickly reported original take on the incident. Many news outlets were retracting their original stories. The story as it was unfolding was becoming more and more complex. Knox got his knickers in a knot. He took great offence at being accused of "pumping out" a premature take on the incident. He responded by pumping out a number of rapid-fire, defensive tweets. Knox put me in my place, telling me I was wrong to think he had any preconceived opinions. He didn't. But, "as for more questions, yes, I have them," he tweeted. He continued, "If I were a reporter chasing the story I’d ask them. I’m not. I’m retired and on Twitter." And putting his much BS-Detector to good use, I might add. I told Knox, "I feel very strongly about journalism. It's an incredibly important job. But, since retiring, I've learned Edward R. Murrow was right: journalists have thin skins. Journalists are quick with fast quibs but slow with meaningful responses. I added, Twitter is not the best venue." I wasn't just thinking of Knox here but all the journalists reporting this story. I wondered if the chap with drum was really a Vietnam vet but I didn't contact any reporters with my question. I've tried that in the past and it lead nowhere good. Knox didn't appreciate my reference to Edward R. Murrow and a famous remark of his. He took my remark very personally. In retrospect, I'm not surprised. At one point, Knox told me, "Please don’t lecture me about journalism. I spent years and years dealing with these issues. The best journalists are skeptics [sic] as hell. But counter-narratives emerge all the time, on many different kinds of stories. People finally speak up. Another video surfaces ..."
Knox sure knows how to bring out the snorting, charging bull in me. Counter-narratives are one of my personal red flags. Get the story right the first time. And be damn careful with the counter-narratives. A journalist must do the job properly the first time, make the background calls and check all the facts. And tread lightly when it comes to counter-narratives. These put my own BS-detector a quivering. Think of the famous 60 Minutes Benghazi Report. The show, based on a counter-narrative, had one flaw: the counter-narrative was wrong.
. . . “60 Minutes” aired a report that called into question the official version of what happened when the U.S. diplomatic compound was attacked in Benghazi, Libya. At the core of the story was a source, Dylan Davies, who worked as a security contractor for the State Department. Davies had a book coming out that purported to share new facts about what happened that night, and what he did. Problem one: he lied to the show about what he did and saw, thereby making a core piece of evidence in the “60 Minutes” counter-narrative false and undercutting the entire segment. Problem two: it only took days for other news outlets, such as The Washington Post and The New York Times, to reveal significant flaws with the story, and with Davies. . . . "
I bow to the professor. He is, of course, right when he talks about journalism. He's been a guiding force in the industry for years. I'm sure his positions, when it comes to journalism, are completely defensible. It is how things are done. But, my contention is that folk, like the good professor, should be confronted. The old rules have let us down time and time again. It is time for a new playbook. The New York Times couldn't recognize a staged photo! Or think of the infamous UFFI story. Thousands of people's lives were severely impacted by that bit of shoddy journalism. Retirees who had put their faith in their home as their retirement nest-egg saw it shrivel because a lot of journalists wanted to be first with the story. The counter-narrative, although true, never got traction. The counter-narrative never got traction. I still see the UFFI myth treated as truth by the media. Or how about another famous BS-Detector failure: Liberation Therapy? People, people full of hope, died having this procedure preformed out-of-country. My heart doctors were not fooled but journalists were. Today, even the doctor behind the theory admits it does not work. I believe journalists need more than a BS-Detector. Journalists need time and facts and money. It is looking as if we can add the Covington students to our list of infamous BS-detector generated stories. Nathan Phillips approached the students not the other way around. Nathan Phillips did not serve in Vietnam. He is not a Vietnam War vet. Most students bought their MAGA hat for the March of Life. 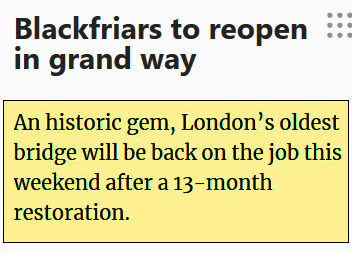 In years past, students bought Obama-era "Hope" hats while visiting Washington, D.C.
As the former owner of a heritage automobile, I was disappointed when Í first inspected the re-opened Blackfriars Bridge. When I expressed my disappointment and explained why the poor paint and lingering corrosion bothered me, my friends patiently explained it's an old bridge not an old car. It's been rehabilitated, not restored. I thought for a moment. I recalled how my old Morgan was built in the days before seat belts. When I sold the roadster, the first thing the new owner did was install seat belts. This was an act of rehabilitation and something I should have done years ago. I had allowed myself to be seduced by the restoration mythology: if it wasn't there originally, it shouldn't be there. Period. And bunkum. Old or new, equipment must meet today's safety requirements. Anything else is stupid. I had been stupid. I wonder about all the unpainted stuff that I found all over the Blackfriars Bridge. 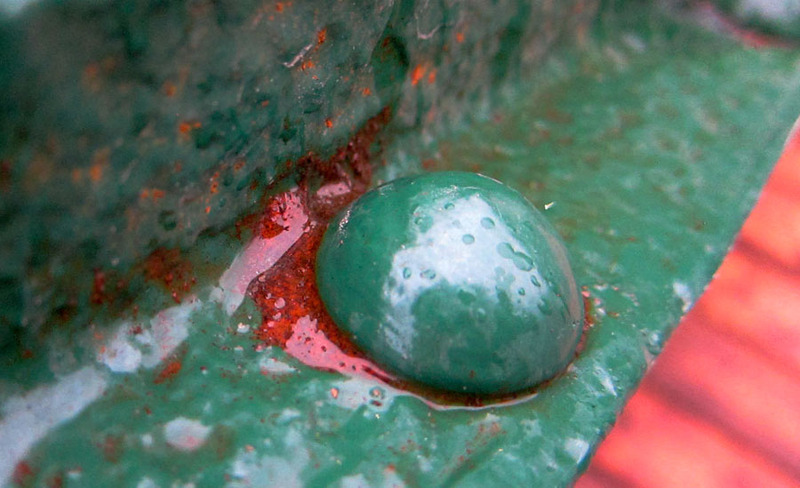 The corrosion would not have been acceptable on an old car, rehabilitated, restored, re-anythinged. Still, it is an old bridge and not an old car. Those running the City of London should be proud. 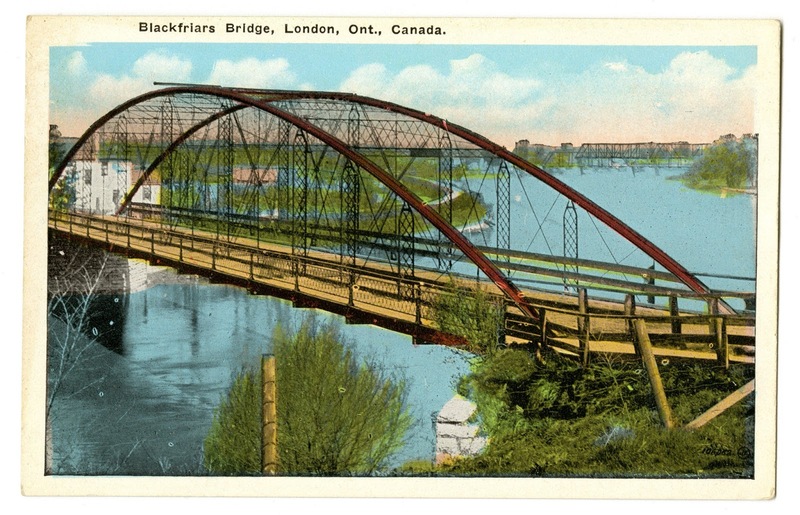 The continuing presence of the Blackfriars Bridge over the North Branch of the Thames River is remarkable. The fact it is also still carrying traffic is a rare achievement. It is for some very good reasons that the Blackfriars Bridge of today is not, for the most part, the original structure. Instead, it is a ghost, an elegant reminder that the past is past, that times change and that stuff must change too or be left behind. The Blackfriars Bridge has changed. It has not been left behind. This is not a restored structure but a rehabilitated one, and a somewhat repurposed one. It no longer carries horses pulling farm wagons but cars, albeit in only one direction, plus numerous pedestrians and cyclists. 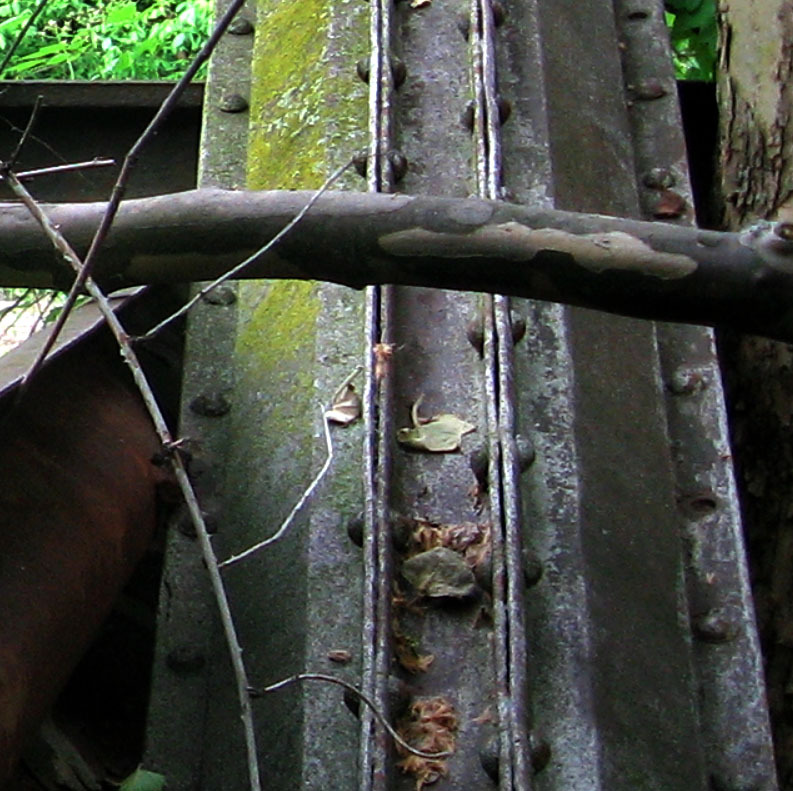 Top detail of derelict Wrought Iron Bridge Co. bridge arch. It was almost 70 years ago that the bridge load was restricted to five tons. A few years later it was necessary to do "significant work" to strengthen truss members and reduce vibration. By 1986, the load limit had to be reduced again. This time to only three tonnes. 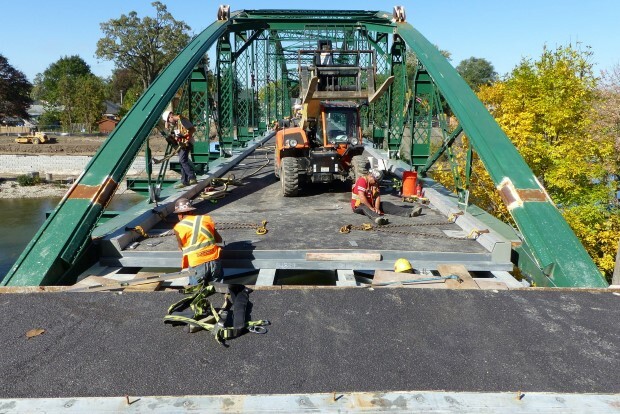 Since that first "significant work", the bridge has undergone a lot of significant remedial work. I'd argue the bridge standing over the river today is a new bridge which incorporates the visual elements of the original bowstring-arch truss bridge. I'm old enough to recall when hundreds, if not thousands, of wrought-iron bridges were still in use throughout both Canada and the United States. Almost all are now gone. Worn out, demolished, replaced. I was disappointed by the new bridge because too many folk, often journalists, refer to the work as "the restoration of an historic gem." It isn't. It's better. The myth of restoration is a killer. Structures have been demolished when found impossible to restore. Restoration can be an impossibly high bar to clear. Why? Because of what true restoration entails. Restoration modifies an heritage structure to accurately reflect its appearance at a specific point in its past. This may involve the addition or the removal of structural material. The engineers who rebuilt the London bridge to meet today's demands proclaimed quite openly that they were rehabilitating the structure. Rehabilitating is not restoring. I am old enough to recall when many of the present "heritage" structures (in old Quebec) were not there. Many of these buildings were not restored but recreated. Much of the area's 18th century ambiance so loved by tourists is faux. Once we accept that our new bridge is a glorious salute to the past, a glowing, functioning memory, we find it possible to openly ask, what is the best approach to preserving the illusion of heritage? To answer this, we must bring artists and historians into the rebuilding effort and not just engineers. 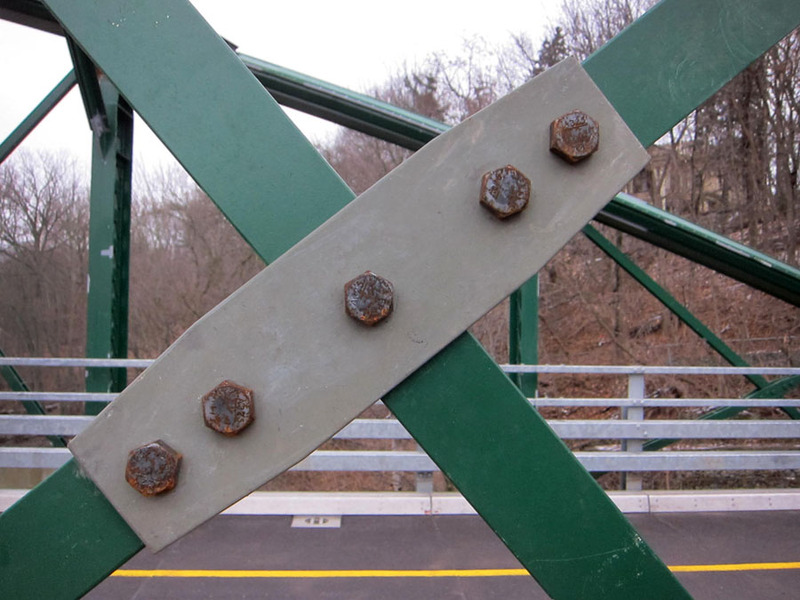 Artists like Ted Goodden, who featured the bridge in his art, can bring a lot to the rehabilitation table. Those who take the time to look will discover that the new Blackfriars Bridge is magic--a practical answer wrapped in romance and sentimentality. Gérard Morisset, the art historian behind the reclaiming of Old Quebec's heritage texture, argued it is completely acceptable to restore a structure "to a state of completeness that may never have existed." A construction update picture posted by The City of London. 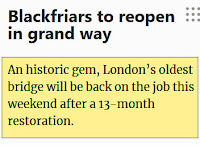 Make no mistake about it, the reopened Blackfriars is new bridge, a stronger bridge, a bridge with a future not just a past. This is not just a facade like the old roomless hotel pasted into the northeast corner the Budweiser Gardens. This is a working bowstring-arch truss bridge. Appreciate it. On my death, to my Indian friend, I leave my pacemaker. So how dependable are pacemakers? Well, the University of Michigan has a program for recycling devices no longer needed by their original owners. Why are they no longer needed? Uh, the heart patient has died. Pacemakers cannot make a heart beat that no longer has the strength to continue. There's no point in flogging a dead horse, as they say. Tossing out perfectly good pacemakers with the cadavers is seen as a waste by the U of M folk. Working with funeral directors and crematorium staff, along with interested individuals, the U of M is recycling pacemakers that still have life in them, so to speak. And who takes the old units. Why the third world. Many pacemakers are good for up to ten years today. Many folk die long before a decade has passed. Put these used units in the right patients and it it is a match made in heaven. For more information, click the My Heart Your Heart link. This topic is tough to discuss. The danger is that one may come across as simply a defender of the medical device industry. I'm not. Another danger is that one may come across as a media-hater. Again, I'm not. I worked at two newspapers and one television station and have great respect for many of the folk with whom I once worked. Medical devices are often foreign objects surgically implanted into the human body -- a damn hostile environment for many materials. 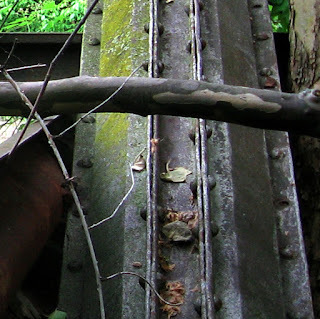 Corrosion is but one of the immediate threats. Think about the discredited Liberation Therapy treatment proposed as a treatment for MS (multiple sclerosis). Doctors were slow to embrace the untested surgical treatment as it often involved the off-label use of a coronary artery stent being inserted in a vein in a patient's neck. The media was quick to attack the doctors, government regulators and insurers for their reticence. The Post Media paper in London, Ontario, ran a story about a local woman unable to obtain government health care funding for the treatment. When I looked into the wisdom of placing a stent in a patient's neck, I was told by the medical professionals questioned that they would not do it. Why? Too dangerous. Liberation Therapy is no longer bandied about as a miraculous cure for MS. The doctors and clinics that were so quick to provide the treatment should be ashamed. Patients died having this surgery. It was a high-risk-no-reward treatment. 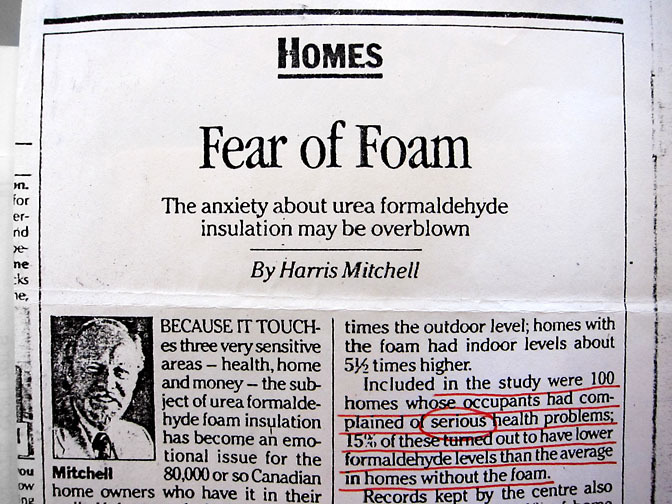 And the press should be ashamed of the role it played in advancing this quackery. So, is there a problem with medical devices? Yes. But it is a complex problem and the breathless reporting of patient-recipient horror stories, as I've encountered on CBC, is not the adult discussion needed. My heart doesn't beat well. At least, it doesn't beat well on its own. I have a one hundred percent heart block. This a problem with my heart's electrical system and not a problem with my arteries. I'm not concerned about having a heart attack. What threatens me is heart failure. You see, on its own my heart would beat only about 30 times a minute, maybe even less. Without my pacemaker, my ankles would swell, fluid would gather in my gut and surround my heart. My lungs would fill with fluid and I'd have a difficult time breathing. Within days I'd be dead. My pacemaker is an implanted medical device attempting to partially correct my heart's electrical system failure. It is not a perfect solution and there are problems associated with having one implanted. How anyone could think that having a chunky metal box inserted into one's chest and attached to one's heart by 26-inches of wire could possibly be risk-free puzzles me. CBC is reporting that tens of thousands of medical devices distributed worldwide — like pacemakers — were approved for sale with little scientific evidence . . .
CBC claims devices such as pacemakers are suspected of having played a role in more than 14,000 reported injuries and 1,416 deaths. This number is so large because it includes problems associated with a number of devices, of which pacemakers are but one. 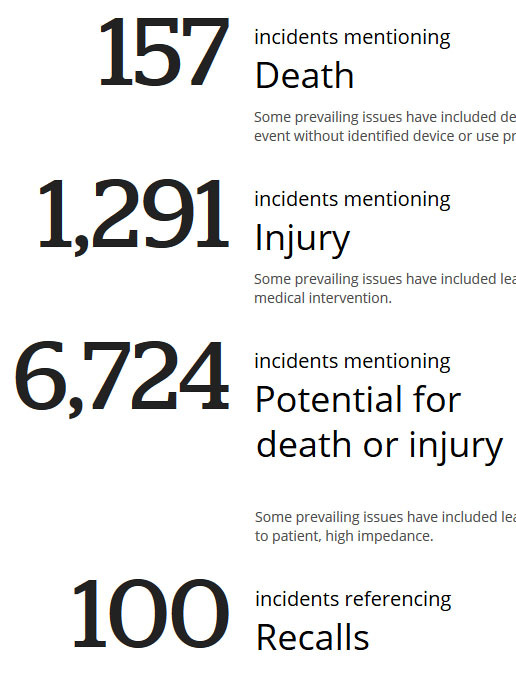 Digging deeper I discovered CBC posted an interactive medical device database of associated incidents. I typed pacemaker into the device category field. I discovered 157 deaths and 1,291 patient injuries are associated with pacemakers. This is not all that surprising when the complexities of the system and the all-too-clear dangers are considered. 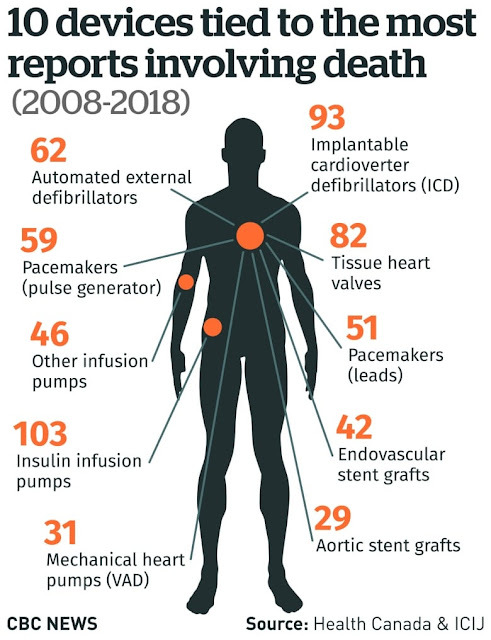 Simply making a pocket in a patient's chest and inserting a metal box is fraught with danger: infection, blood clots, stroke and the list just grows. And, if a problem does arise, the solution may well demand another operation. Surgery is never risk free. What did surprise me were some of the incidents that made the list. I admit to cherry picking but this is my point. Don't just take the numbers and other bits of information at face value. The CBC encourages us to question the motives of the device makers. The manufacturers may be driven by a need for profit. I suggest the CBC, and all news folk, should face questions as well. Journalists may have their own demons driving them forward. Think viewers, readers, awards and even think profits. I like to think it's the demand to tell a good story that blinds them. patient piloting air ambulance involved in plane crash died. no evidence to support a device-related cause for the event. generator and associated leads were removed due to infection. source of infection unknown. patient died from liver cirrhosis. patient died due to acute coronary artery disease. device tested and functioned properly and within specification. patient was 85.
pacemaker implanted for heart block. developed non-ischemic cardiomyopathy with ejection fraction diminishing. root cause was physiological. CBC has not verified the accuracy of the data. Reports might have been filed to Health Canada with inaccurate or incomplete information. There is no certainty that the medical device caused the reported reaction. A given reaction may be the result of an underlying disease, process or another coincidental factor. One report may be tied to multiple parts of the same device and multiple reactions may be connected to a single patient. The data does not reflect any CBC assessment of association between the health product and the reaction(s). I'm on my second pacemaker. I got seven years out of my first unit before the battery failed. I apparently suffered no infection from the replacement surgery. My luck seems to be holding. But, I cannot be completely certain I escaped the threat of infection until a full year has passed. My original lead, the 26-inch wire connecting my pacemaker to my heart, was retained and reused. It has now been operating in a very hostile environment, the human body, for eight years. How long that lead will last is anyone's guess. The electricity-conducting wire could corrode or succumb to metal fatigue. Leads do fail and the frequency increases with time. And, of course, there is always the threat of manufacturing defects and recalls. Just living carries risks. I simply live with a few extra risks. But risks in life are often nicely balanced by rewards. I believe the risk/reward ratio associated with my pacemakers are weighted heavily in favour of my pacemakers. Despite the scary tone of some of the CBC reporting concerning pacemakers, the ICIJ stories, the source for the ongoing CBC reports, is often not as frightening. The ICIJ is actually fairly reasonable. The following is from the ICIJ report titled: Frequently asked questions and resources for readers. Do all medical devices have problems? No. For example, pacemakers and implantable cardioverter defibrillators (ICDs) have revitalized and saved millions of lives. I'm not keen on having man-made stuff implanted into my body. I've had car problems, microwave breakdowns and expensive camera battery failures. Stuff fails. It is a fact of life. Sadly, sometimes stuff fails because of poor design or shoddy workmanship. This is not acceptable in any situation but it is a worst case scenario when it involves the failure of a medical device. The ICIJ is doing us all a service. The ICIJ asks who is watching the medical device makers? I wonder who is watching the journalists? Hello: I'm a retired photojournalist who took a buyout after more than three decades working for Ontario dailies. A fellow has to have some fun and the blogs just grew from there. Feel free to comment as I'd love to make these the best blogs of their kind. Cheers, Rockinon.